This recipe was waiting in the line for a long time. Nevertheless, I wanted to share it with you, because it was so delicious. We always love to eat carrots and pancakes, of course. The salty pistachios add a nice crunch to this dish and make it something really special. All in all, a nice dinner (or lunch) and if you want more veggies, just top it with some extra carrots or serve a salad as a side. At first, you prepare the pancake batter. Therefore you combine the flour, polenta, a pinch of salt, pepper and curry to taste in a bowl. Then you separate the eggs and put the egg whites in the fridge. Next, you pour the egg yolks and the milk in the bowl with the dry ingredients and mix it all up. You should get a nice and even batter that has to rest for 30 minutes. In the meantime, peel the carrots and cut them lengthwise in half. Then you melt the butter in a pan and fry the carrots at medium-high heat. Next, you sprinkle the sugar over the carrots and continue frying until it has dissolved and the carrots start to look shiny. Now you can put them aside and finish the pancake batter. Beat the egg whites to stiff peaks and gently fold them in the batter. That way you’ll get a fluffy and voluminous pancakes. Next, you pour some oil in a pan and bring it to medium-high heat. 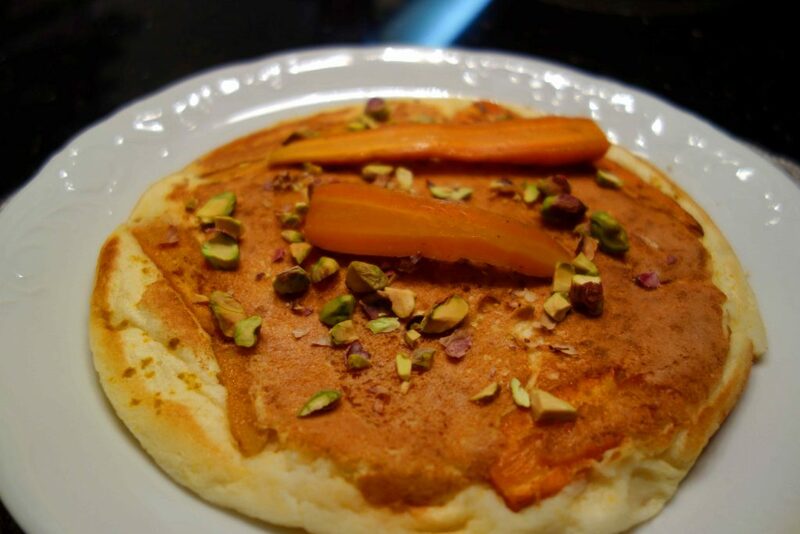 Pour a fourth of your pancake batter in the pan and put about a fourth of your glazed carrots on top. Now bake the pancake until the surface starts to dry and then take a big plate to help you flip it over. Put the pancake in the oven to keep it warm and bake another three pancakes. When you are finished, chop the salted pistachios and sprinkle them on top of your pancakes before serving. If you have some leftover carrots, you can add them as well.